On Scene: The Best TFS Gifts Under YOUR Tree! The Best TFS Gifts Under YOUR Tree! According to all the packages we shipped, and the hustle and bustle of our fulfillment department the last few weeks, it seems like many people had wrapped goodies from TheFireStore under their tree this Christmas season. 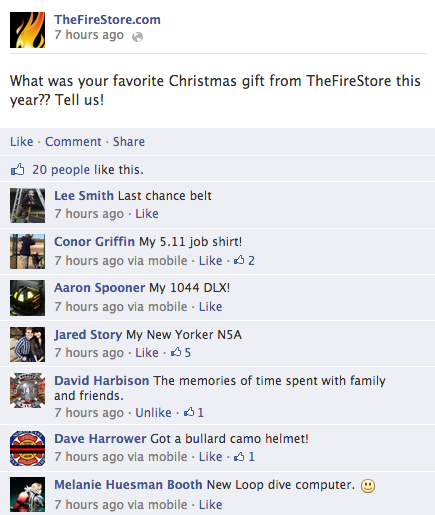 Everything from the New Bullard Camo Helmets, Streamlight Survivors, Fire Cam's, to Boston Leather Radio Straps---you name it, and someone got it for Christmas this year! We are so thrilled that opening up a gift from TheFireStore could have very well been the highlight of your day, or been the best gift this year. So THANK YOU for letting us be a part of your holiday. Have gift certificates to spend? Have fun browsing our website, and shopping new products!